It was a quiet day at the Front Porch Library, the rain bucketing down. Vivienne came first. She and I started the giant under-the-sea floor puzzle. For some reason she fixated on measuring the length of the edges as we assembled them, carefully placing the ruler, then counting the numbers that marked off each inch out loud. Klark and Olivia barreled in for a grand total of three kids, but that was okay. 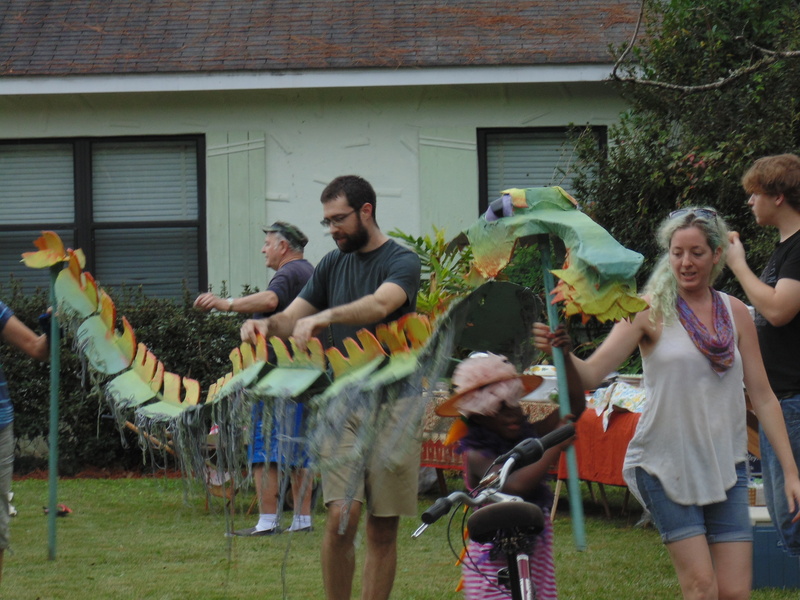 We had a huge neighborhood block party last night so everyone was tired from eating chili, introducing themselves to neighbors and taking part in the bike parade that featured a very long dragon designed by our neighbor on the corner, Meg Fulford. We lugged that dragon (a three carrier job at least) on a long loop through Seminole Manor Neighborhood, the bikes circling around us. See a glorious photo of the dragon up above. Miss Heather arrived at the library. We broke out the games. Miss Kary checked up on us, played with us for a while then decided we had things covered–the block party was on her lawn so she had definitely done her duty in the neighborliness department. Then we played Twister. Miss Heather and I are more limber than you might expect, although we both have a little difficulty distinguishing left and right. Vivienne and Olivia became teachers. I got sent to detention for kicking someone (although Vivienne assured me that I didn’t do it on purpose). As time was running out, Klark assembled a puzzle in record time. We ate cupcakes left over from the block party. Yup, we had a good old time.